Situated in the historic village of Hahndorf in South Australia, Hahndorf Knife Shop has a selection of locally made hand-crafted knives of exceptional quality. 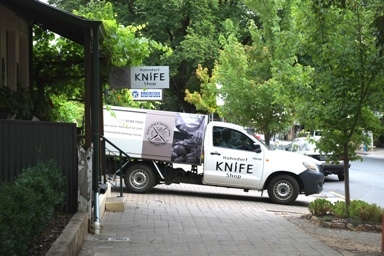 Whether you are a chef, hunter, fisherman, farmer, collector or someone looking for that special gift, Hahndorf Knife Shop can supply or make the knife you are looking for. A unique feature of this business is being able to watch Nathan as he sharpens the chef knives with precision or works on his next creation. A tiny cottage, with the shop being less than four by four metres, it overflows with a medley of interesting knives as well as accessories. Hahndorf Knife Shop is a local family owned and operated business which includes Lyn and her son Nathan. 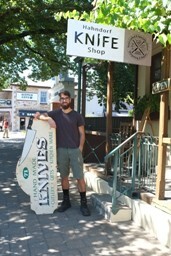 Nathan has established himself as a respected young knife maker and has developed a following with his reputation for not only making knives but also for his restoration work and knife sharpening skills. After completing an off site workshop Nathan is now crafting fully hand forged knives with a focus on kitchen knives although he is still making other styles of knives as well. For the latest updates and new products see our Facebook page.